This is a reprint of the original volumes (Passmore and Alabaster, London, 1897) by Pilgrim Publications in 1992. It is the only unabridged edition of the original now printed. It was originally done in four separate volumes but this set is four volumes printed in two large books. 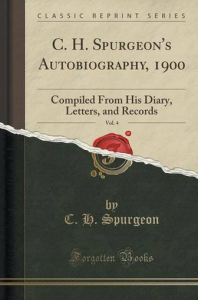 Most of the material was written by Spurgeon himself who obviously intended one day to compile such a work. Upon his untimely death in 1892 (being only 57 years of age) his wife Susanna completed the work, often writing brief chapters herself to fill in the story (She writes three chapters on “Love, Courtship, and Marriage” which begin the second volume, describing how they met, courted, and married). The first volume takes the reader from Spurgeon’s ancestry and birth to the time he was called to London to become the pastor of the New Park Street (Baptist) Chapel (in 1854 at the age of 19). Both his father and grandfather were Congregationalist preachers and Charles had received infant baptism by them. The story of his conversion is well-known as, on a snowy Sunday morning, January 6, 1850, he happened into a Primitive Methodist Chapel and heard a simple message preached by a deacon and was saved. Coincidentally, he preached on January 6, 1856, from the very same text, Isa. 14:22, on the same day, at the same time, six years later.